15 Complete FULL VERSION Games! The most realistic gaming graphics ever! Experience the latest in virtual reality technology with 3D images that float inside and outside of your monitor! Become immersed in unbelievably real 3D environments as our patented stereoscopic 3D glasses instantly create a truly 3-dimensional viewing experience with all of your favorite gaming titles. You have to see to believe--thrills guaranteed! Intuitive depth perception for more accurate height and distance calculation, plus amazing visuals! 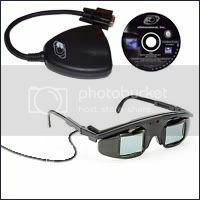 The E-D 3-D glasses instantly convert virtually all of your existing PC video game titles into true 3D. That means a real sense of depth and distance as you're taking aim at the enemy battalion approaching, trying to find the apex of the next turn, or coming in for a carrier landing in your F-14. It's why so many customers report improved game play performance when using our glasses in addition to stunning scenery and visuals. Installation is a snap with no USB or serial ports required and nothing internal. Just install our patented software one time, plug in our adapter to any standard PC, and we guarantee you'll experience the best gaming graphics EVER. �	Exclusive support for all video cards and both CRT and LCD monitors. Sports Illustrated Swimsuit in 2D and 3D - This is a collector's treasure! Rare footage of Swimsuit models Heidi Klum, Kylie Bax and Shakira Ledard captured on-site at a Sport's Illustrated photo shoot. On one CD, you get full motion video of these stunning models at work in 2D or 3D. Select the 2D option, and immediately you are on the beach watching the models perform for the cameras. Select either of two 3D options and watch the same content transformed into a rich, deep 3-dimensional experience that is truly captivating. Fully interactive. Filmed on location in stunning 3D, this live action footage takes you behind the scenes at the SI photo shoot 2000. Enjoy 28 minutes of a multi-media 3D CD with footage of Heidi Klum, Shakira Ledard and Lylie Bax.